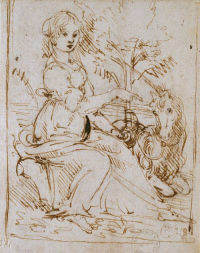 The style of this drawing, in which a young woman is seen pointing at a placid unicorn that she holds by a leash at her left side, indicates that it was probably produced early in Leonardo’s artistic career, sometime during the late 1470s. The technique of diagonal parallel hatching is not consistent and the outlines themselves are not entirely confident in their handling in comparison to later pen and ink drawings by the artist. The framing outlines around the composition suggests that while no painting exists of this subject, it seems likely that the artist intended to paint one at some point.